Elly's smoked tofu stir-fry recipe is bursting with zingy, fresh flavours, thanks to an inventive pink grapefruit dressing. 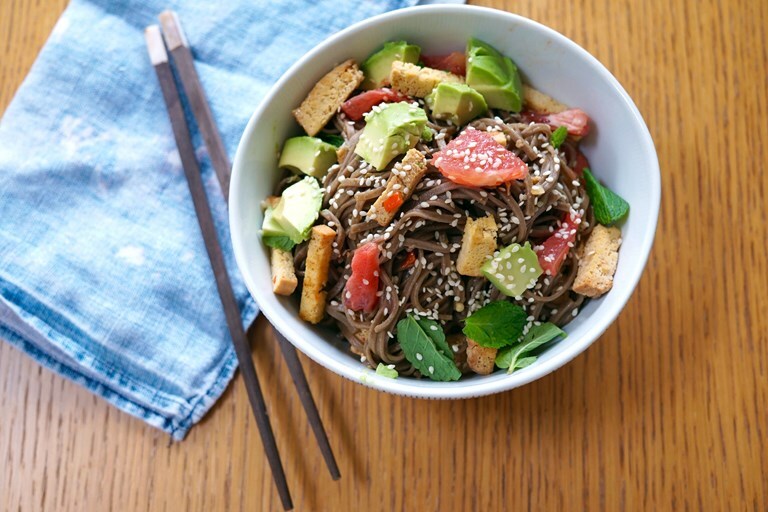 Smoked tofu adds a wonderful depth of flavour, while comforting soba noodles, avocado and ginger keep things healthy in this fantastic vegan dish. I have converted many a tofu sceptic with smoked tofu. It has an irresistibly savoury tang and a fabulous firm texture that makes it perfect for stir-frying or simmering in sauces, and its strong flavour means it partners beautifully with more assertive Asian ingredients like chilli, garlic and sesame. I like to slice it thinly for stir-fries, providing maximum surface area to crisp up in the pan and soak up all the other flavours you throw at it. 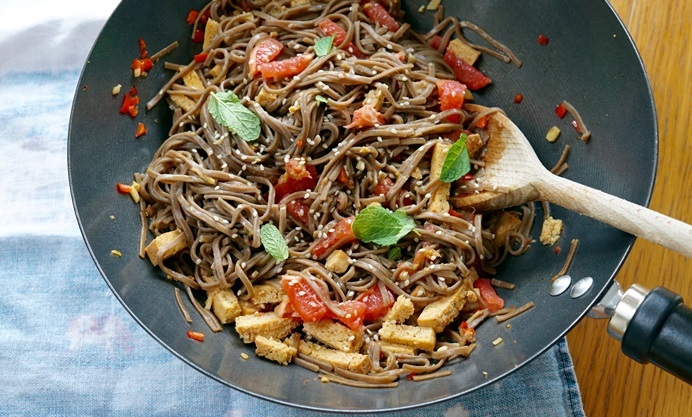 This recipe takes some classic Asian aromatics – chilli, ginger, sesame, soy – and mingles them with moreish, nutty Japanese soba noodles. The fresh, zingy dressing is perfect against the rich smoked tofu and dark noodles, and the unusual inclusion of creamy avocado, fresh herbs and tangy grapefruit adds another interplay of flavours and textures. 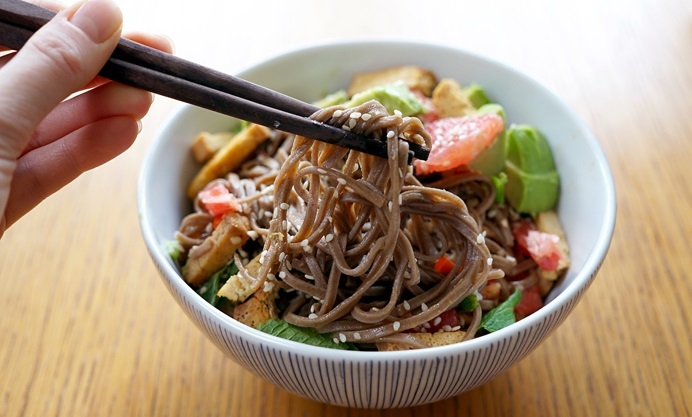 This is a beautifully healthy dish full of contrasts, and the irresistible pairing of charred smoked tofu with tangled noodles also makes it wonderfully comforting. It’s a new, fresh take on a stir-fry, and it has the added bonus of being vegan. You could, of course, make this with ordinary tofu rather than smoked. – When frying tofu, it always helps to drain as much excess liquid out of the tofu as possible before you start, even if you’re using tofu labelled ‘firm’. I wrap the block of tofu in kitchen paper or a clean J-cloth, place it between two chopping boards and weigh the top board down with something heavy. Leave it for as long as you can, ideally a few hours. This helps the tofu crisp up in the pan and absorb flavours without becoming watery. – Once you have drained your tofu, you can also marinate it for maximum flavour – try a simple mixture of soy sauce, a pinch of brown sugar, chopped chilli and lemongrass to start with, but you can throw almost anything at tofu. You could try marinating it in Indian tandoori paste, or a mixture of olive oil, lemon juice and herbs for a Mediterranean twist. – Try not to move tofu around in the pan too much when frying – you don’t want to break it up, and it will have more chance of caramelising in the heat of the pan if you don’t move it around constantly. – Silken tofu can also be used in desserts, or to make a vegan ‘scrambled tofu’ (great with chopped tomatoes, chilli, turmeric and spring onions).